The System.Data.SQLite DDEX provider does not support Visual Studio 2017. 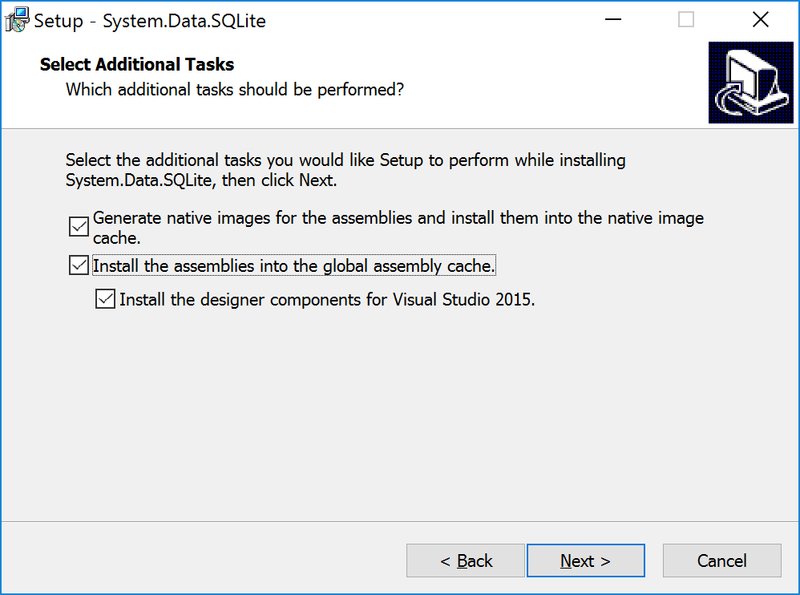 This post describes how to work with SQLite and Entity Framework 6 in Visual Studio 2017, using the "SQLite Toolbox" DDEX provider for EF6. Notice that this provider only supports the EF 6 Tools, and not other Data Source scenarios, for example Typed DataSets. Install using Package Manager Console or NuGet Manager in each project. Make sure to install the same version as the tools package above. Add, New Item, Data, ADO.NET Entity Data Model. 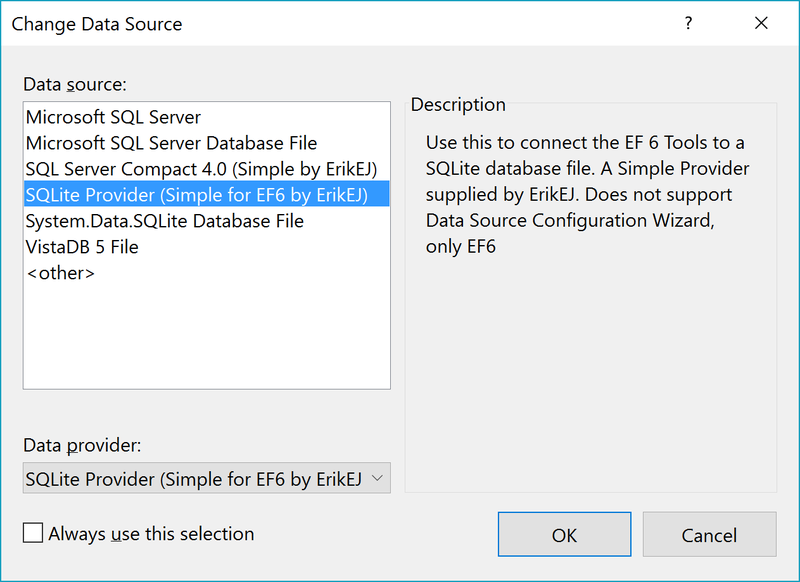 Choose "EF Designer from Database" or "Code First from Database"
Use "SQLite Provider (Simple for EF6 by ErikEJ)" when creating a connection to your SQLite database file. A number of developers are still, in 2017, developing new solutions for Windows CE / Windows Mobile using Visual Studio 2008 and SQL Server Compact 3.5 SP2. Unfortunately, Microsoft has removed the official download of the SQL CE 3.5 SP2 package for devices, which contains the cab files for installing the SQL CE runtime on various processor flavors of Windows CE / Windows Mobile and also contains a cab file for installing a System.Data.SqlClient (ADO.NET provider for SQL Server), that allows you to access SQL Server directly from a Windows Mobile device. In this blog post I will describe the steps required to get the Device MSI installed on your development PC. Luckily, it is still currently possible to request the latest updates/hotfixes of the 3.5 SP2 runtime – I have a comprehensive list here. We can take advantage of the fact, that each “patch” is essentailly a full release of all applicable packages, and that build 8109 is a full re-release of all possible packages. This is a list of some of the available Entity Framework Core extensions out there that expand the functionality of the Entity Framework Core runtime. Only libraries that extend DbContext or similar are included, and they must be published on NuGet.org. Second level caching is a query cache. The results of EF commands will be stored in the cache, so that the same EF commands will retrieve their data from the cache rather than executing them against the database again. Loads and saves entire detached entity graphs (the entity with their child entities and lists). Inspired by GraphDiff. The idea is also add some plugins to simplificate some repetitive tasks, like auditing and pagination. Add triggers to your entities with insert, update, and delete events. There are three events for each: before, after, and upon failure. Reactive extension wrappers for hot observables of Entity Framework entities. Retrieve the primary key (including composite keys) from any entity as a dictionary. Get typed access to the OriginalValues of your entity properties. Simple and complex properties are supported, navigation/collections are not. Entity Framework Core 1.0 has been released at the end of May, including the providers for SQL Server Compact 4.0 and 3.5 (supplied by yours truly). I plan to blog in more detail about using EF Core with this new provider. A useful SQLite NuGet package has been released, for use with the .NETStandard 1.0 portable platform. SQL Server 2016 was released, many highlights and improvements to the relational engiene, as highlighted in the “It just runs faster” blog series. And SQL Server 2016 Developer Edition is now free (was 50 USD earlier)! I was recently made aware that a hotfix for SQL Server Compact was made available in 2014 – but better late than never. I have moved the source code and issue tracker to GitHub, and I am planning to move the remaining CodePlex content “soon”. I have also moved the source of the scripting API that the Toolbox uses extensively to the same GitHub repository. As always, and suggestion, bug reports and pull requests are welcome! The icons of the extension have all been overhauled, and updated to use the latest VS 2015 icons/images. From users already trying out the latest bits, I have received positive feedback on this visual change. I have also started using Azure AppInsights to track (anonymously) feature usage etc. This revealed (maybe not surprisingly) that the most use feature is the query editor. So for this release, the query editor has received a lot of attention. In addtion to the changes below, the general layout of the editor has been streamlined (no more rounded corners). The first button is new, and will open a “New Qery” window against the same database file. An options dropdown have been added to expose some of the (maybe overlooked) options that are available for the query editor. Setting these only affects the current query window, use the general settings (which you can reach via the Setting button in the query editor now) to change the “default” value for a setting. “Show result in Grid”: By default, the query results (from a SELECT statement) will be displayed as text for performance reasons, but you can opt-in to have the results displayed in an Excel like grid instead. “Show Binary Values in Result”: By default, binary values (from for example “image” or “rowversion” columns) will be displayed a “System.Byte”. Enabling this will instead display the actual value as a hexadecimal string – but may affect performance. “Show null values as NULL”: Until recently, NULL values were displayed as an empty string, not as “NULL”. Disabling this reverts to the old behaviour. “Ignore DDL errors”: Enabling this (per query window only) feature, allows you to run the database creation scripts generated by the Entity Framework “Generate Database from Model” feature, and ignore errors caused by for example pre-existing tables. “Use classic (plain) grid”: This will revert to using the “old” grid for grid results – about the “new” grid, see below! “Autofilter” :The grid has built in filters, in the example above to filter on invoices for a particular customer (or even set of customers). “Grouping”: Add columns you want to group by to the surface above the grid. In the example above, Invoices are grouped by Customer Id. The options for the Toolbox have finally been integrated in the standard Visual Studio Tools/Options pages. Added link to blog post to DataAccess.cs to better explain how to use it. Support for row-returning SQLite statements beginning with "WITH"
The “Add Connections from Solution” feature has been enhanced to scan all projects in the current solution for any SQL Server Compact and SQLite files. If any are found (based on the file patterns defined in Options), the Toolbox will attempt to add them as new connections. The generated classes will also contain any views defined in the SQLite database, and nullable values will be mapped accordingly (for example int?). Also notice that if you prefer the previous behaviour, this can be changed here, via the ShowNullValuesAsNULL option.